You'll be £40.00 closer to your next £10.00 credit when you purchase British Submarines in Two World Wars. What's this? Although the Royal Navy did not invent the submarine, Norman Friedman’s new book demonstrates how innovative the service was, to an extent which few will recognise. Its submarines performed well in combat in both world wars, and often in unheralded ways. Few will be aware that in 1914 Britain had the largest submarine fleet in the world, and that at the end of World War I it had some of the largest and most unusual of all submarines – whose origins and design are all detailed. During the First World War they virtually closed the Baltic to German iron ore traffic, and they helped block supplies to the Turkish army fighting at Gallipoli. British submarines were a major element in the North Sea battles, and they helped fight the U-boat menace. These roles led on to British submarine operations in World War II. Readers will be aware of the role of US submarines in strangling Japan, but perhaps not how British submarines in the Mediterranean fought a parallel costly but successful battle to strangle the German army in North Africa. Like their US counterparts, interwar British submariners were designed largely with the demands of a possible Pacific War, although that was not the war they fought. And the author shows how the demands of such a war, which would be fought over vast distances, collided with interwar British Government attempts to limit costs by holding down the size (and numbers) of submarines. It says much about the ingenuity of British submarine designers that they managed to meet their requirements despite enormous pressure on submarine size. As in other books in this series, the author demonstrates how a combination of evolving strategic and tactical requirements and evolving technology produced successive types of design. 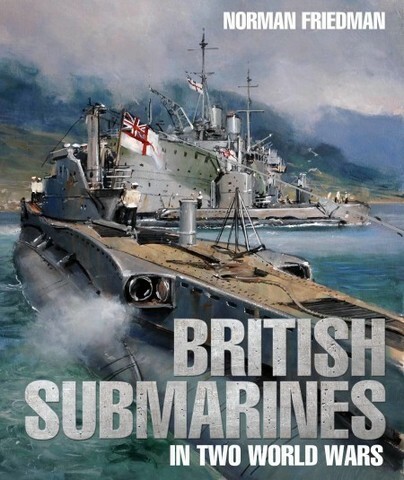 The Royal Navy was always painfully aware of the threat enemy submarines posed, and British submariners contributed heavily to the development of British anti-submarine tactics and technology, beginning with largely unknown efforts before the outbreak of World War I. Between the Wars British submariners exploited the new technology of sonar (Asdic), both to find and attack enemies and to avoid being attacked themselves. As a result, they pioneered submarine silencing, with important advantages to the US Navy as it observed the British. And it was a British submarine that pioneered the vital postwar use of submarines as anti-submarine weapons, sinking a U-boat while both were submerged. This feat was unique. Heavily illustrated with photos and original plans, this new volume from Norman Friedman, incorporating so much original analysis, will be eagerly awaited by naval historians and enthusiasts everywhere.